The whirlwind. The wonder. The blessing. The measurements. The (straight) plumb line. The cornerstone. Just how do we measure what faith is? I know that I am. We all are. God is. The Great Mystery… is. This is the whirlwind. The wonder. The blessing. The measurements. The cornerstone. Jesus. THIS is the moment James and John have been waiting for too. The time to join with Jesus in all the glory of God showing up. Here. Now. And God changing EVERYTHING. James and John are certain, very certain, of their faith. They have the unwavering faith that Jesus will affirm their reputation as “THE” Jesus Followers. Jesus’ response? “Well… not exactly… You do not know what you are asking…”(Mark 10:38). Do we? Do we know what we are asking? Do we know what we are asking of the confirmation students today? If I were to ask any of us gathered here today, do we know just how to measure faith? Because I am not sure that I do. But I do know that I am. We all are. God is. The Great Mystery… is. There is so much that we do not know about God’s way. Jesus’ way. The presence of the Spirit. Yet we gather here today, asking the teens that have been participating in confirmation to affirm their faith. In February of 2017, they began the journey with Pastor Phil and Rebecca. They talked about God. Jesus. Spirit. The Bible. Church. And then they gathered with Pastor Laura. Over the past year, the youth, their mentors, their families, and many of you… and I… have been participating in their faith journey as well. We visited St. Ignatius Orthodox Church, the Sikh Temple, Temple Beth El, Deer Park, the Hindu Temple, and other faith neighbors. 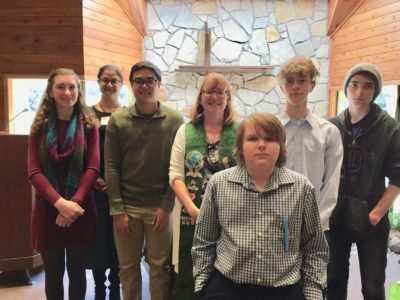 The teens took part in local service projects through Summer Servants, the UCC’s Great Lakes Regional Youth Event, and two of them traveled with Lynn Hilgers and I to Shannondale UCC in Missouri this summer for a rural immersion. It has been a whirlwind. Full of wonder. Blessings. Faith. Questions. Life is too often a whirlwind in which it is all too hard to grasp any sense of wonder. The dust and anxiety, anger and frustration, swirl thickly about. Diana Butler Bass writes that, “Urgency, obligation, technology, and busyness all prevent us from encountering awe and wonder. Too often, we feel we have to go away from everyday life to the ocean or the mountains to recapture the mysteries of existence. But we need not go far to find wonder. We can look inside. For the greatest mystery is the one we most often take for granted: that we are alive.” (7-Days, Day 4). I am. We all are. God is. Into this sooty swirl, we ask the youth to make promises – covenants – with the Church today. With us. How do we determine what the measurements are by which we will Be Church together? Thus for today’s reflection I offer you a give and take. A space for wonder. An exchange. Job had an exchange with God. James and John had an exchange with Jesus. May we have an open exchange with the Spirit that is amongst us. For this is a day of wonder. Wonder about God. Wonder about Jesus and the Spirit. And to affirm it all. So first I offer you, the Church, the faith promises that Ben, Brandon, Calvin, Jack, and Izzy have made. These are their responses to questions posed during the past two months. I have asked their permission to share their commitments to God, to Church, to you. Church, you have heard their words. Their promises. Promise in turn to be present for them. Guide them in their sense of wonderment. Ben, Brandon, Calvin, Jack and Izzy, you have done something that I know of no other confirmation class doing: you have tackled the showing up over the past 2 years with 3 different pastors. THAT is amazing. Bless you for your patience, your teaching, and your showing up during all of those transitions. I have asked Pastor Phil and Pastor Laura to share a few words with you today. I now invite you to listen. Hold their words in your hearts. Dear Ben, Brandon, Calvin, Izzy and Jack – Congratulations on reaching this milestone in your lives. I am so glad that I had the chance to part of the beginning of your journey toward Confirmation. Your explorations of God, Jesus, Spirit, Church and the multiple faiths in our world will serve each of you well as you continue on the path of being followers of Jesus – and members of Memorial UCC. One of my favorite phrases is “Grace abounds” and grace certainly overflows in your lives today. From Pastor Laura comes another blessing from Jan Richardson’s “Circle of Grace: A Book of Blessings for the Seasons.” Beloved. Beloved is where you begin. And with their curious insistence whisper your name. Beloved—from my time with you over the past year, I offer you this blessing: Wonder. The wonderment that Church, and science, and questioning, and wandering, and sharing, and helping, and transforming, and all that is around us… is what faith is. What Jesus calls us to. And that this is not an easy, fluffy, puppies and kittens type of faith. This is a faith immersed in the world’s whirlwinds. The ongoing order of creation that at many times seems sooooo out of order. This is a faith soaked in the need to show up: At Luke House, with Music Makers, with the choir, or bells, or the instrumentals. The need to serve: In the media room, as an usher, a reader, or a mentor for the youth. In the dropping off and letting go: items for the Personal Essentials Pantry, contributing financially to the church, to the CROP walk, to the wider church, bringing food for fellowship. In connecting: through sending cards of thanks, or “thinking of you”, visiting a member of the church who is homebound, going to Jesus Core and Youth at Synod. Ben, Brandon, Calvin, Izzy, and Jack, as you are confirmed this day, take time for wonder. This is the blessing I leave with you today. Welcome into full covenant with Memorial United Church of Christ! “Whirlwind.” Merriam-Webster. Accessed October 20, 2018. https://www.merriam-webster.com/dictionary/whirlwind. “Commentary on Job 38:1-7 [34-41] by Karla Suomala.” Job 38:1-7 [34-41] Commentary by Karla Suomala – Working Preacher – Preaching This Week (RCL). Accessed October 20, 2018. https://www.workingpreacher.org/preaching.aspx?commentary_id=2671.